Daring to Look presents never-before-published photographs and texts by the great photographer of America's migrant and displaced people, Dorothea Lange. Her eloquent reports from the field of a single significant, year, 1939, in the depth of the Great Depression, portray America's massive upheaval and resettlement, its private greed and environmental degradation, its public miscalculations, and its efforts to restore hope. Lange held up her mirror to American society that we might see who we were, how we came to be, and what we were in the process of becoming. Her words and photographs speak powerfully to the present, for the dynamics she saw and recorded are still shaping American lives and landscapes. Daring to Look is the first book to restore Dorothea Lange’s work to its full context by reproducing the text of her field reports together with the images she captured on film. The book focuses on a single year, 1939, when Lange began to write her “reports from the field” or general captions as she called them. It was a pivotal year for Lange’s work and for the nation. In Daring to Look Lange tells the stories of dozens of families against the backdrop of the places they live and the larger processes that are shaping their lives. Her reports from the field reveal the heartrending consequences of shifts in jobs and decline in industry and their impact on the environment, the human stress of migration and resettlement. They demonstrate too the human capacity for endurance, resilience, cooperation, and hope. Daring to Look tells how Lange accomplished this extraordinary work and explores the mysteries of why her 1939 documents were “lost,” why Lange was fired at the end of 1939, and why, even now, Lange’s contributions are ignored or disparaged by many critics. 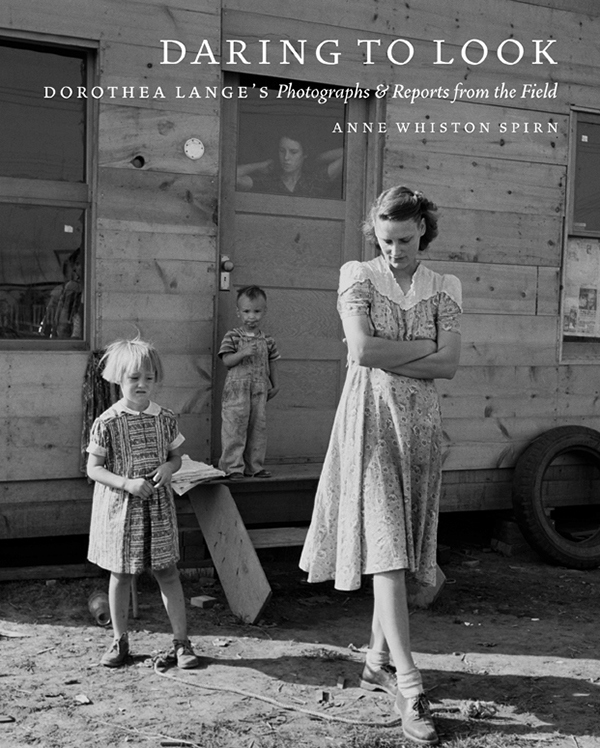 But Daring to Look is not only a book about Dorothea Lange, 1939, and the Great Depression. 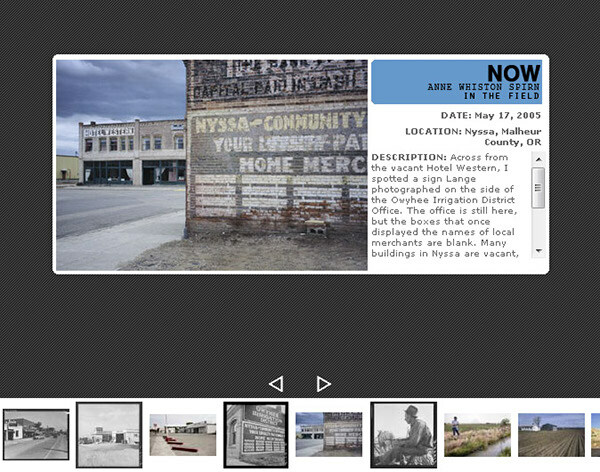 Reading Lange’s images and words is to see the roots of our own time and place. Her work speaks eloquently to the present, for the forces she saw and recorded in 1939 are still in play: the shift from the family farm to industrialized agriculture and practices that victimize migrant workers and child labor, to name just a few. Lange’s reports from the field record familiar problems (how to resettle an enormous population following a disaster; the disconnect between government bureaucrats and the conditions on the ground) and portend future conflicts (such as those that now rage over water in the West). The last part of the book recounts my own journey to the places Lange photographed in 1939, what I saw there, the people I met, and what they told me. Lange’s photographs were my passport into foreign territory. They led, for example, to eastern Oregon and to Allen Brown, a ditch rider for the Owyhee Irrigation District, who introduced me to families I knew from Lange’s photographs and to others who took their farms out of the sage brush in the 1930s; he showed me how to ride ditches, and taught me about water in the arid West. The stories Lange told in 1939 are still unfolding; somehow, in the process of tracing her stories, they became my own. Much has changed since 1939, but much is the same. Left: Dorothea Lange.Malheur County, Oregon. October 1939. US Library of Congress LC-USF34 021359-C. DARING TO LOOK is the first book to restore Dorothea Lange’s work to its full context by reproducing the text of her field reports together with the images she captured on film. The book focuses on a single year, 1939, when Lange began to write her “reports from the field” or general captions as she called them. It was a pivotal year for Lange’s work and for the nation. In DARING TO LOOK Lange tells the stories of dozens of families against the backdrop of the places they live and the larger processes that are shaping their lives. Her reports from the field reveal the heartrending consequences of shifts in jobs and decline in industry and their impact on the environment, the human stress of migration and resettlement. They demonstrate too the human capacity for endurance, resilience, cooperation, and hope.